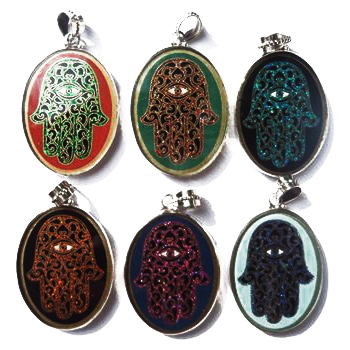 The hamsa (Arabic: خمسة‎ khamsah, also romanized khamsa, meaning lit. "five") is a palm-shaped amulet popular throughout the Middle East and North Africa, and commonly used in jewelry and wall hangings. Depicting the open right hand, an image recognized and used as a sign of protection in many societies throughout history, the hamsa is believed to provide defense against the evil eye. The symbol predates Judaism, Christianity and Islam. In Islam, it is also known as the hand of Fatima, so named to commemorate Muhammad's daughter Fatima Zahra (c. 605 or 615 – 633). Levantine Christians call it the hand of Mary, for the Virgin Mary. Jews refer to it as the hand of Miriam in remembrance of the biblical Miriam, sister of Moses and Aaron.